Those handheld green lasers pointers may not be as harmless as you thought. A recent study released by researchers at the National Institute of Standards and Technology (NIST) has revealed an alarming trend. Of 122 hand-held laser pointers tested, 44% of red lasers and 90% of green lasers tested failed federal safety regulations. The primary culprit was overpowered units. The Code of Federal Regulations in the United States limits commercial class IIIa lasers to 5 milliwatts (mW). And yes, lasers above 5 mW are commercially available in the United States, but it is illegal to market them as Class IIIa devices. Some units in the NIST study tested as high as 13 times over the legal limit at 66.5 mW. For context, many military grade rifle mounted lasers are rated at 50 mW. A diagram of a typical diode-pumped solid-state laser. (Credit: NASA/Langley). “Our results raise numerous safety questions regarding laser pointers and their use,” stated NIST laser safety officer in the recent paper presented at the Laser Safety Conference in Orlando, Florida. Why should backyard astronomers care? Well, since hand-held lasers first became commercially available they’ve become a familiar staple at many public star parties. 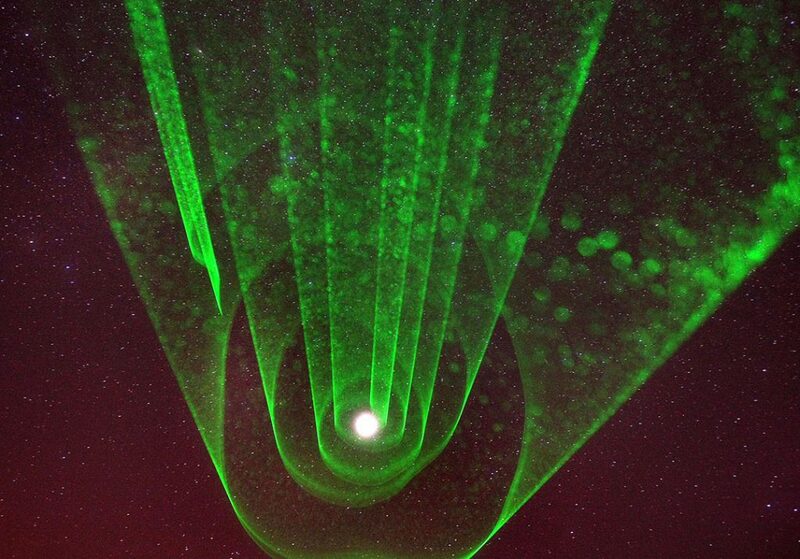 Reflecting back off of the dust and suspended particles in the atmosphere, a green laser provides a pointer beam allowing the user to trace out constellations and faint objects. Lasers can also be mounted on the optical tube assemblies of a telescope for pointing in lieu of a finder scope. A typical 5mW green laser pointer. (Photo by Author). An amateur astronomy club based near San Antonio, Texas even coordinated signaling the International Space Station with a pair of powerful searchlights and a 1 watt blue laser in 2012, just to prove that it was possible. But such devices are not toys. Even a 5 mW laser can temporarily blind someone at short range. Further eye damage can often linger for days or even permanently and can go unnoticed. This is why researchers working around lasers in research facilities such as LIGO (the Laser Interferometer Gravitational Wave Observatory) must submit to routine eye exams. Its not the Death Star… LIGO engineers practicing proper safety around the gravity wave observatory’s 35 watt Nd YAG laser. Credit: NSF/LIGO). The trouble with green lasers is that, well, they look too much like light sabers. It’s for this reason I keep mine on a very “short leash” at star parties and NEVER hand it off to anyone, no matter how well meaning, child or adult. I also NEVER point it below the local horizon, (there’s wildlife in them trees). A laser reflected inadvertently off of an optical surface such as a car window or primary mirror can also do just as much damage as a direct aiming. And also, NEVER aim one at an aircraft. In fact, it’s a federal violation to do so. The Federal Aviation Administration has reported a 13-fold trend in reported aircraft/laser incidents from 2005 to 2011. There has also been an upward trend in individuals being tracked down and prosecuted for such offenses. If it blinks, assume it’s an aircraft and steer clear! 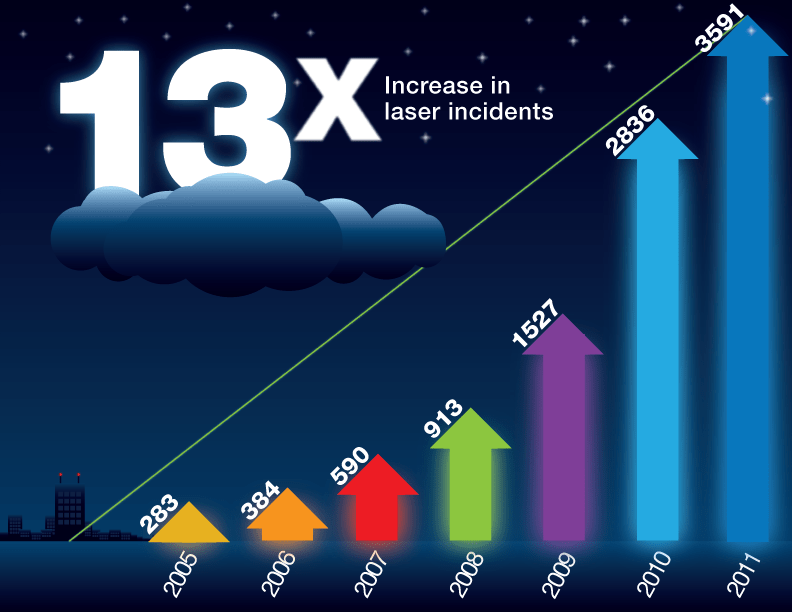 Reported incidents of laser/aircraft violations from 2005-2011. (Credit: Federal Aviation Administration). In a post-9/11 era, the Department of Homeland Security has been concerned with the potential threat posed by laser pointers as well. It’s not yet illegal to fly in the US with a 5mW laser pointer in your carry-on luggage, but and several countries now outlaw them all together, a note for traveling astronomers. Note that the de facto policy often comes down to the particular TSA officer you’re dealing with. With this sort of news, we wonder if laser pointers might become outlawed entirely in the coming years. 5mW range lasers are generally classed IIIa or 3R systems. By the American National Standards Institute (ANSI) guidelines, such devices under the recent NIST study would fall into the much more hazardous IIIb range for 5-500 mW lasers. Such lasers can cause permanent eye damage with direct exposure for periods of as little as 1/100th of a second. Safety distances for a 5mW green laser. (Wikimedia Commons graphic under a Creative Commons Attribution-ShareAlike 3.0 License). It’s also worth noting that actual reported cases of laser injuries are fairly rare. A 2004 paper from the Archives of Ophthalmology cites 15 injuries worldwide each year, while a recent 2012 paper in PLoS ONE estimates “220 confirmed laser eye injuries have occurred between 1964 and 1996,” for an average of 6.9 laser injuries per year. The Code of Federal Regulations limits output for green laser pointers to 5mW in the visible range and 2mW in the infrared. 75% of the tested devices exceed this standard for infrared emission as well. Note that there have been anecdotal reports that even the point source generated by a laser (say, by shining it against a wall) can be excessively bright. This recent NIST study was the first time we’d seen a back up argument for this. Many of the cheaper handheld lasers sold online (think in the 20$ USD range) may forgo the infrared filtering component all together. In the end, we’d hate to see these crucial tools for astronomy outreach banned just because a very few individuals were irresponsible with them. 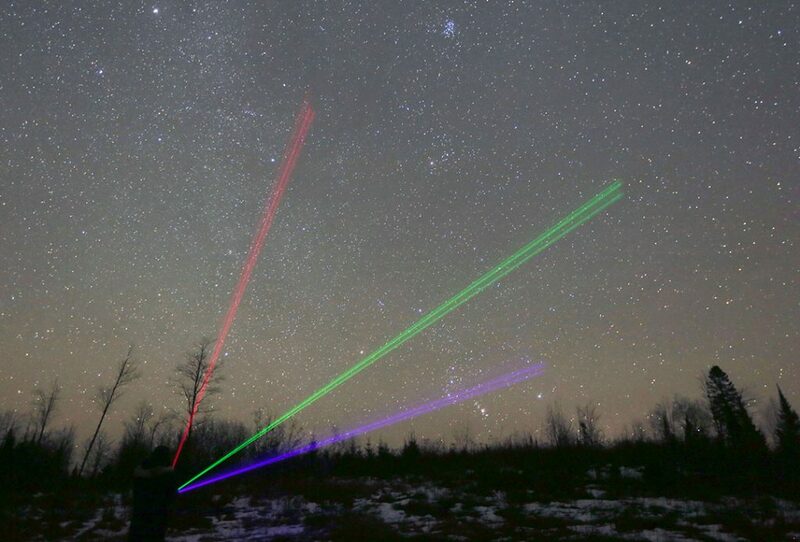 Through accountability from production to application, we can assure that laser pointers remain a vital part of the amateur astronomer’s tool kit.